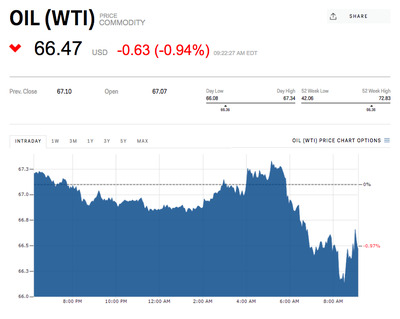 Oil fell about 1% early Friday. The Energy Information Administration reported a surprise drawdown in US stockpiles Thursday. OPEC has offered a “lack of clarity” on the future of supply cuts, one analyst said. Follow oil in real time here. Oil fell Friday morning as markets mulled the future of OPEC supply cuts and after US crude production continued to climb to record highs. West Texas Intermediate shed 1.09% to $US66.39 per barrel at 9:30 a.m. ET. Brent, the international benchmark, was down 0.8% to $US76.97 a barrel. A Gulf source familiar with the thinking of the Saudis, told Reuters earlier this week that the group is “satisfied” with keeping the output cuts through December. There had been previous reports that members wanted to raise output sooner amid higher prices and supply disruptions in Venezuela. Artjom Hatsaturjants of Accendo Markets said a “lack of clarity” regarding OPEC’s intentions to ease voluntary supply cuts could have contributed to the dip. Also weighing on prices, an Energy Information Administration report on Thursday said that US crude production continued to climb to record levels last month. It rose 215,000 barrels per day to 10.47 million bpd in March, the report showed. But Hatsaturjants said oil is poised to recover after the EIA also posted a surprise weekly crude drawdown of 3.62 million barrels in the US. Analysts had predicted stockpiles would fall by 525,000 barrels, according to Reuters. Elsewhere, the greenback – which tends to move opposite of dollar-denominated commodities prices – rose 0.25% versus its major peers after the US posted a strong jobs report. Brent is up 53.25% over the year.